Sometimes after a marathon cooking session where I've cooked for example, a roast or a meat dish, some spuds, pumpkin or ricey dish, a curry for the week ahead and prepared a nutritious dessert/ cake/ sweet slice for lunch boxes and a gluten free loaf I have a greens crisis! This recipe is perfect for when you reach the point of cooking overload, you're running out of time 'cos the masses are hungry and/ or you don't want to generate any more washing up. 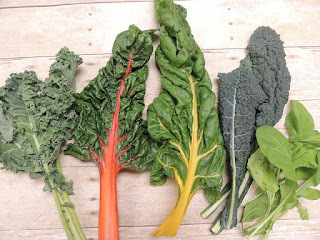 I use a selection of green, red and purple leaves such as rocket, kale, cabbage, beet leaves and radicchio or what ever else I have on hand. The other thing I love about this technique is that it reduces the bulk of the raw leaves, makes them more palatable and easier to chew, meaning you can get more of the goodness that plant based foods have to offer. Chop into thick or thin slices. Place into bowl. Dress with olive oil (or your preferred oil) and give your greens a quick vigorous massage. I add a pinch of good quality sea / rock/ Himalayan salt ( for extra adrenal support) because I'm a salt fiend. After 5-15 mins the leaves have softened considerably and are wonderful alongside of anything really. Omelettes, meat, fish, haloumi etc etc. Variation: You may wish to add shaved parmesan, tasted nuts or seeds or some sardines/ mackerel.